SCHUYLER COUNTY, 2014 -- The first time I visited Schuyler County, I was immediately struck by the beauty of the rolling hills, but I was not on a sightseeing trip. I had come down from Northern New York to visit a young lady from Watkins Glen who I would eventually marry: Susan Bauman, daughter of Oakley and Margaret Bauman. Oakley was a prison guard, and back then as tough an individual as I had had occasion to meet. His wife was a much gentler soul. Together they had created a family of five children, Susan being the only female and, thus, holding a special place in her father's heart. It was spring break for the schools up north, and so Susan -- a teacher in one of them -- had decided on some time at home with her folks, and with helping her mother run the Country Cards gift shop that Margaret owned on the Main Street of Odessa. Oakley was next door, operating a gun shop, guns being his primary avocation. I was driving a hot little MG convertible, bright yellow and with more get-up-and-go than any car I had owned to that point. I was in my late 20s, and Susan in her mid-20s. She liked both me and the car. I found my way to Odessa, and pulled up in front of Country Cards. The visit was not exactly planned; Susan didn't fully expect me, although she knew I was just unpredictable enough to show up anywhere at anytime. She saw the car pull up, and greeted me at the door -- pretty excited, I noticed, which was a good sign. I was coming off a failed marriage and didn't trust fully that any female would actually be glad to see me, although we had gotten along famously in the city in which we lived: Watertown. "Come meet my mother," she said, and so I was introduced to Margaret, who to this day is the same sweetheart she was then. "This is Charlie," Susan told her Mom. "He's crazy." I was not displeased at being thought of as crazy, but I doubted her parents wanted to hear it, so I cringed a bit. Then it was time to go next door and meet Oakley. He was smiling as I was introduced, but when Susan repeated to him that I was crazy, I noticed a perceptible hardening in his eyes -- at the same time that he was taking my hand in his for the traditional handshake, and applying a frightening amount of pressure. The man was strong, and he was -- I decided -- a little scary. That feeling did not waver for years -- reinforced as it was that evening. I was invited to dinner at the Bauman house, and after a wonderful meal, Oakley decided to demonstrate for me how he discouraged unruly inmates in prison. He was at the time employed at the Elmira Penitentiary. His method was this: He held a nightstick in one hand, wrapped that arm around me from the back, pulled the nightstick into my neck with both hands, applied some pressure, and lifted me from the floor. "See?" he said. "See how effective it is?" It was an uncomfortable position, mildly painful, and one that generated a bit of anxiety in me. Oh .... who's kidding whom. It was more than a bit of anxiety. I wondered what in God's name I was getting into. When he let me down and the pulsating fear subsided, I nodded. "I see," I said. "I see." I gained some measure of payback, of course, by marrying his daughter. By tradition, the bride's parents paid for the wedding and the party. That all took place on Sept. 18, 1977. Although Susan and I lived in Watertown -- I worked at the daily newspaper there -- we were married in the Baptist church in Odessa, a couple of blocks up the street from the Country Cards shop. I don't recall how, exactly, we settled on that spot. We wanted something small and in the area in which Susan had been raised, and that particular church met the criteria. "I want it quaint, charming," said Susan. "Is that okay?" It was. In fact, we were interested in utilizing the local epitome of charming -- the Lawrence Chapel out on Rt. 228. But it was already booked on the designated afternoon, so we settled on the small and charming Baptist church. In the weeks leading to the ceremony, Susan and I traveled to Schuyler County several times, visiting her parents and talking to the minister of the church, The Rev. John Binkiwitz, about the ceremony. And on one occasion -- after meeting with him -- Susan and I wandered the streets of Odessa in the evening ... a lovely, peaceful evening, with the stars out and the wind down. In the silence, we heard a heavenly sound, and decided after some investigation that it was coming from the Odessa-Montour High School, located within sight of the church. The sound was a musical one -- like a piano, but not. It was a distinct sound, and I finally decided it might be an electric piano. There was, it turned out, a concert going on in the school cafeteria. We approached the school and entered, and listened from outside the cafeteria until the music from the selection ended. We asked a man at the door -- a teacher at the school -- who exactly had been producing the music, and he said it was Nancy Learn, a 15-year-old student at the school. And yes, it was an electric piano -- Nancy's own. "We'd like to speak to her," I said, and Susan nodded. The man said he would ask Nancy if she might come out in the hallway. While we waited, Susan and I communicated in shorthand. A minute or so later, Nancy Learn exited the cafeteria and entered our lives. After introducing ourselves, we took mere seconds to hire her for our wedding reception. It was the slender teen's first paying job as a musician. It was the first of many paying gigs for Nancy. She went on to study music at a prestigious school in the South, returned home, married and became known regionally for her music. She sang at various locales, and produced several CDs. The wedding was traditional in every way, I think, in keeping with Susan's needs. Hers was a conservative family, and it had certain expectations. Her parents were, as it was, uncertain of me, coming as I did from a marriage gone bad. Oakley told his daughter that she should enter this union with eyes open, for I didn't have a good track record. Unswayed, she carried forth with planning the nuptials, and the ceremony went off in grand fashion -- although the weather was not cooperating. We picked what was probably the rainiest, foggiest day of the year -- which defeated part of the purpose of the place we had selected for the reception: the Glen Motor Inn, which boasts what is normally a fantastic view of Seneca Lake and the hills beyond to the east. On a day of such celebration, little can diminish the joy -- but I felt that the fog shrouding the lake was potentially omen-laden. I would not think such a thing nowadays, for with the years I have shed much of my superstitious nature; I have grown beyond a tendency to obsess over details and, I think, beyond emotions that, unfettered, can affect judgment. Today, I dare say I would marvel at the fog, and consider in its shifting mass and light the potential for interesting photographs. But back then it disturbed me, this turn of nature. I therefore recall the day on differing levels. I recall the nerves preceding the wedding ceremony, the joy of the vows, and the pride I took in knowing that a woman as lovely as my new wife would want someone with as many emotional and intellectual shortcomings as I possessed. There was, also, the nagging aggravation triggered by the ominous-seeming weather. But, in truth, it wasn't ominous at all -- not unless you chalk up as a direct result the cancer 27 years later that took my wife. I might have linked two such events then. I don't now. The day's combination of fog and rain was simply Earth being Earth, and Schuyler being Schuyler. We did not live in Schuyler County until four more years had passed -- years of work in Northern New York, followed by a journey around the country in a camper for several weeks in 1979 (a journey that could take a book to tell), followed by a year of living outside of Ithaca, in a new apartment complex not far from the airport. We worked that year as co-employees -- at the Pyramid Mall, operating a popcorn wagon created by a company called Cretor's out of Chicago. It had just been placed on a spot near center court at the mall, and was temporarily run by a company representative named Steve who was advertising for a manager. Susan and I both decided we could do the job, and figured if we went in together for an interview, one of us might snag the position. We'd certainly get Steve's attention, at any rate. As we approached the popcorn wagon along the long mall hallway, Steve spotted us, and decided on the spot that he was so impressed by Susan that if she were indeed there for an interview, he would hire her. And so he did -- and I had to tend to my wounded ego. But there was ample salve, for Susan and I had decided that if one of us got the job, the other would be hired in an associate's role. And so I was. Thus we spent an enjoyable, peaceful year outside of our chosen careers. Susan would, eventually -- years later -- get back to teaching, and I would, before long, get back to journalism. We moved to Odessa in 1980 -- in a house on the corner of Main Street and College Avenue, at the turn up toward the school. It was located for us by Susan's father, who clearly wanted us to stay in the area. I had misgivings -- having quit our Northern New York jobs to travel the country, we had seemingly endless areas to choose for residence -- but always wanted to please my wife, and so we purchased the house, moved in, and became Schuyler residents. Of course, as I have been told by various residents at various times, I would always be considered a newcomer. 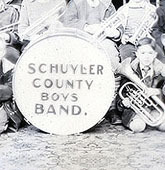 Only native-born folks were considered of Schuyler County. My wife was just such a native, but I was not. The house was an old one, the front half dating back to 1865, and the back half to 1910. It was akin to a traditional farmhouse -- having been, I suppose, just that back in its earlier days. The state road that passes in front of it was not always heavily traveled; in fact, the road used to veer north just yards past my house on its way to Odessa Hill. The land that is dominated by the state highway was field -- farmland. We always felt a presence in the house in those early days -- and chalked it up (in my superstitiousness) to the spirit of Vernie Williams, who lived there many years before and used to run what became The Odessa House bar. It was, when he operated it, an ice-cream parlor. Vernie was also the first constable of Odessa -- a position that had long since fallen out of existence by the time we moved in. There was a shed attached to the north end of the house, but it seemed ready to fall over at the first sizable wind, so we had it knocked down. An old, dirt-floored garage completed the structures on the property. The garage had had electricity at some farflung time in the past, but was no longer connected to a fuse box -- the remnants of switches and wires rusted and frayed. The building remained in its primitive state for decades -- as though stubborn to join the modern era. It was only after Susan had died that I decided to do something about it -- which is evident in recent days by a bright siding and an interior with a concrete floor, insulation, a pinewood ceiling, electricity and a fan: a soon-to-be new office for The Odessa File. In the first couple of years after we moved in, we could afford very little beyond the necessities of life -- but opted to build a family, nonetheless. We welcomed Jonathan to the world on July 5, 1981, and his brother David on March 23 1983. With Jonathan's arrival -- the year after we moved into the house -- we took greater note of our surroundings, and hired an electrician to check the wiring. He said he was amazed the place hadn't burned down around us, the wiring and connections were so incredibly old. I decided, and Susan concurred, that perhaps it was Vernie Williams' spirit looking out for us. We had the whole place rewired, and started upgrading other aspects of the building, but with only me working at the time -- Susan wanted dearly to be a stay-at-home Mom, raising the kids -- the funds didn't go very far. We did capitalize on a grant arranged by the village that allowed us a new furnace and installation of an I-beam under the rear section of the house, supporting what had become an obvious sag in the old girl. A word here about Oakley Bauman, my father-in-law. We had our differences over the years, but always had one interest in common: his daughter, Susan. And over the years Oakley mellowed -- and I suppose I did, too. He retired from his prison career, started a bullet-manufacturing business, expanded his home, welcomed us into it time and again, and -- in his closing years -- became very well versed in the Bible, to the point of lecturing me on it ... explaining the differing interpretations and always concluding with his choice of the right one. In his closing days in 2006 -- he told me, on a particularly bad one, "Don't grow old!" -- hospice was called in. My sons hurried home, and on the day after their return, Oakley held forth in the large family room of his home. He was the center of attention, sitting up and laughing with the rest of us, totally in control of the moment. The next morning, I received a phone call from one of his sons. Oakley had died, within hours of the family gathering, sliding away peacefully, joining his beloved daughter in death. After hanging up the phone, I turned to my sons. I had trouble finding the words. "We lost grandpa," I finally said. They nodded, as though expecting it. The mood was somber, but accepting. One thing about the moment struck me as odd, though. I was the one who was crying. After our differences, our disagreements, the healthy caution I always wore in his presence ... I was the one who was crying. And it finally occurred to me that the man, while legally and forever my father-in-law, had become much more. In the absence of a father -- mine, Gus Haeffner, had died at the age of 84 in 1994 -- Oakley Bauman had been serving as mentor (religiously, for sure, with the Bible talks), Emergency provider, consoler, and, when you get right down to it, friend. He had taken on the role not only of grandfather to my kids, but father to me. And now, and forevermore, I would be without one. I joined the ranks of the employed again not long after moving to Odessa -- hired by the Elmira Star-Gazette, a Gannett newspaper that had a traditional stronghold on circulation in the Southern Tier counties of Chemung, Steuben and Schuyler, and the Pennsylvania counties of Tioga and Bradford. The paper had morning and evening editions when I joined it, and bureaus in seven locales: Mansfield, Wellsboro, Towanda, Waverly, Corning, Hornell and Watkins Glen. It was a powerful entity for its region -- circulation of more than 50,000 papers on Sundays, and more than 40,000 daily. It had a workforce that packed the newsroom and business offices, and a printing press that was reliable, if lacking in quality. It had been bought used after its predecessor had been damaged beyond help in the flood created by Hurricane Agnes in 1972. I was hired by the paper's managing editor, Wayne Boucher, with the blessing of the executive editor, Rick Tuttle -- men I had never met before my job interview. I was employed first as a copy editor, working nights until about 1 a.m., and sometimes later. It was difficult work, involving new technology -- computers and unreliable phone modems through which our bureau reporters sent their stories. The modems always seemed to malfunction with only minutes remaining to deadline, creating extreme pressure and, on occasion, criticism the following day from "the suits" -- Boucher or Tuttle, both daytime workers who couldn't seem to understand the difficulty of the task at night. The newsroom was run at night by a young man named Mark Murphy, a local boy roughly 30 years old who entertained us each evening with a lively banter that included impressions of various personalities, most notably of Tom Snyder -- at the time a popular late-night TV talk-show host. One of the other copy editors was a fresh-out-of-college lad named Joe Scotto, who often peppered Murphy with questions about the job, sometimes to Murphy's amusement and sometimes to his dismay. One question in particular sticks in my memory, coming as it did from Scotto as the calender turned to December 1980. "What would you do if one of the Beatles died? How would you play the story?" Murphy stopped whatever editing chore he was doing, glanced at me as if to say "What the ...?" and then turned to Scotto. "Why would you ask that?" he said. "The Beatles are still young." "Exactly," said Scotto. "So it would be a big story, right? How would you play it?" Murphy shook his head and muttered something, and I thought he was going to dismiss the question without a reply. But he answered. "I guess it would depend on the circumstance," he finally said. "Yeah, okay," said Scotto. "But what would happen if one of them was killed?" "You mean like murdered?" Murphy asked. "Well, whatever," said Scotto. "I mean, if one was killed, it would be big, right?" Murphy nodded, looked at me again, shook his head almost imperceptibly, and responded. "Yeah, it would be big," he agreed. A week later, John Lennon was shot dead outside the Dakota apartment complex in New York City. Next: The night John Lennon died; and the toll that some 2,000 round trips between Odessa and Elmira took on me in the ensuing eight years. To reach Part 2 of this series, click here.